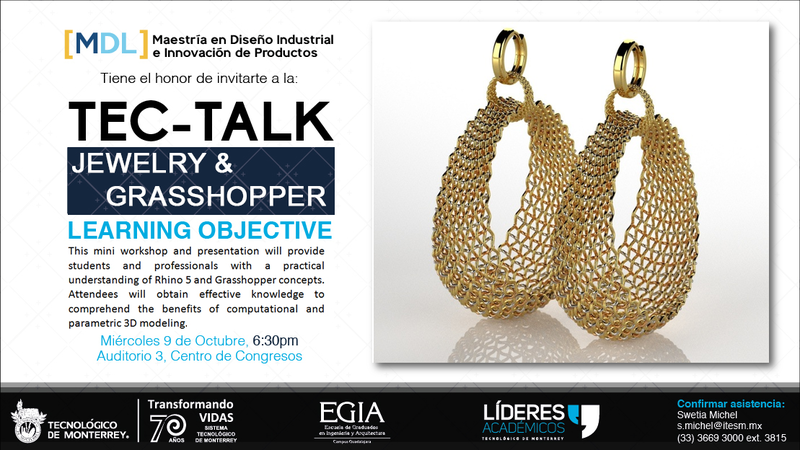 We are pleased to announce a presentation on Generative Jewelry Design (GJD3D) with Rhino 5 and Grasshopper. 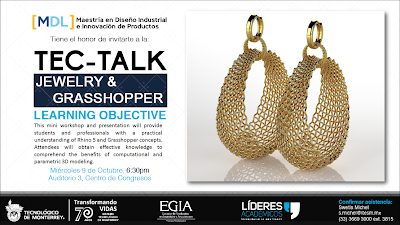 Andres Gonzalez, Worldwide Manager for RhinoFabLab, will be visiting Tecnologico de Monterrey, Campus Guadalajara - México. GJD3D is for jewelry designers who are exploring new shapes using generative algorithms. Grasshopper® is a graphical algorithm editor tightly integrated with Rhino’s 3D modeling tools. Unlike RhinoScript, Grasshopper does not require knowledge of programming or scripting, but still allows designers to build form generators from the simple to the awe inspiring. This event is free. Please reserve your spot. Space is limited! For more information, please contact Swetia Michel - Tel: (33) 3669 3000 Ext 3815 or click here.